What should I use to hold my style? Q What should I use to hold the style for my hair? I wear it a bit choppy like this. Would prefer to wear it slightly messier as in this photo. 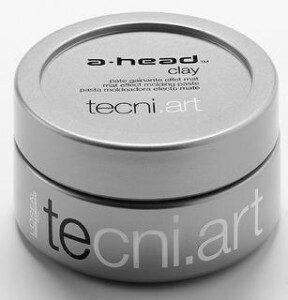 A I feel the best product on the market to give your hair a controlled but also a textured and slightly messed up look would be a product by L’Oreal Tecni.Art called Clay. To use this product first make sure your hair is completely dry by either blow-drying or leaving to dry naturally, then scoop out a very small amount roughly about half the size of a 1p coin and rub onto the tips of your fingers until the product seems like it’s disappeared, then to apply literally rub your fingers up and down fairly fast to the parts of your hair that you want to mess up and achieve that textured feel, for even more texture use a fraction more clay then pick out certain pieces and wipe your thumb and finger along that piece of hair. With the image that you have shown (what your hair looks like before) with this in mind and the fact that your hair can get greasy fairly easily I would use the clay to the mid and end sections first, then with the tiny amount that you have left on your fingers I would rub onto the root area. Depending on how greasy your root area becomes that would indicate whether or not to use the product there, although the clay will give you a matt finish thus opposite to a shiny greasy feel. You mentioned that your hair can become flaky, by using a small amount this will not make your hair become any more flaky and to wash out simply use a shampoo without wetting your hair first, (you will not achieve a lather but that’s normal) then rinse out and wash one more time. Very importantly and I’m speaking about all products, to begin with only use a very small amount and if after applying you feel it’s not enough then add a little more, by doing this you will eliminate the need to re-wash your hair if you’ve used too much.